Work with the natural colors of nature by using natural stone and reclaimed wood. The modern faucets in the shower and sink bring a fashionable contrast to the warm, rustic style of this bathroom. 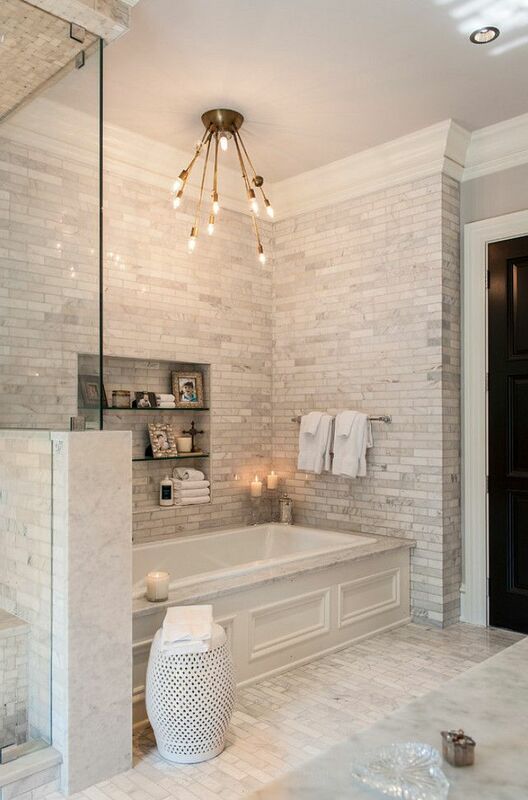 Beige doesn't have to be boring: this beautiful contemporary bathroom is the proof. A freestanding tub set on smooth stones, green plants and natural wood shades make this space as welcoming as it is chic. Industrial doesn't have to be cold. Add a little farmhouse touch, and you have something that's both trendy and homey. Keep the industrial touches light and add some greenery for some organic warmth. The simplicity of subway tile is one of the reasons why it's so popular these days. This classic bathroom decor is simple, clean, practical, and welcoming. It's the perfect style for a guest bathroom or a bathroom used by the whole family. This beachy baby blue bathroom uses soft neutrals to bring a sense of calm and peace... just as if you were lying on the beach. The patterned shower curtain and little beach-inspired details just bring the room together. Sometimes all you need is a bold floor tile to make a statement in an otherwise clean and simple white bathroom. This complexly patterned tile contrasts beautifully with the simple white rectangles on the wall, and the clean look of a straight white shower curtain. A touch of Japanese style makes all the difference in this small attic bathroom. A few pieces of koi wallpaper bring a sense of peace and calm and inspire the other gold accessories in the room. The seamlessness of this bathroom is brought to you by a clear glass-enclosed walk-in shower and a continuous blue tile that bridges the shower and sink areas. If you want to give the illusion of space, don't break up the wall in small pieces! This Parisian bathroom might be tiny, but it packs a punch when it comes to function. An alcove walk-in shower sits behind the sink for maximum space usage, and the notes of wicker and wood make the whole warm and welcoming. Small doesn't mean it can't work, as this tiny but practical bathroom shows. The sideways placement of the tub, good use of wall space, and the bath caddy all help provide all the space that's needed to take a shower without feeling cramped. The large mirror and bold pattern wallpaper make this small bathroom seem bigger than it really is. Why think that a small space means nothing fun? This bathroom shows that you can have big style in even the smallest area. This bathroom speaks for itself: trippy marble pattern wallpaper and an animal skull beg for all the attention. It takes a bold mind to dare this, but dare we say it actually works?